The Soft Top Handboard is designed for all skill levels looking to race through waves. It's made to be super buoyant with a slick bottom to glide through water, while a sticky top skin makes sure you stay on board. Dimensions: 17.5" x 9.5" x 3"
Bodysurfers understand the thrill of riding a wave with nothing between your body and the sea. Slyde handboards heighten the excitement with more lift, faster rides, and greater control. These boards make for great rides on good waves, and good rides even on tamer surf. The idea for Slyde handboards began when a 14-year-old Steve Watts was experimenting with improvised wave riding devices. Turns out a fast food tray from McDonald's was surprisingly effective. He’s worked ever since to refine the idea. Streamlined and glossy, Slyde handboards are built to the same exacting standards and with similar materials as a quality surfboard. Made of urethane foam for buoyancy and a strong triaxial fiberglass skin, these boards will last year after year. A velcro strap keeps you connected at all times. And you won’t have to tie your handboard to the roof either. It’s small enough for a suitcase or the trunk. Slyde offers the Wedge handboard for newbies or intermediate riders. It works best in 1-7 foot swells and the included GoPro mounting point even lets you to capture your ride. 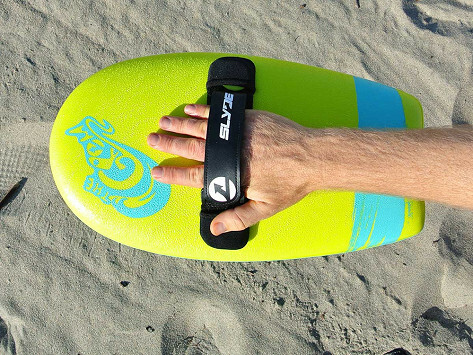 A Slyde handboard will amplify the rush of catching that wave. It’s sure to be an epic time at the beach.